"The explosion of a nuclear weapon is an event of immense power... Within a fraction of a millionth of a second, the nuclear materials and casing of a one megaton weapon are transformed into a packet of energy five times hotter than the center of the sun." "Out of this mini-sun bursts a flash of X-rays so intense that the air for several feet around the weapon is heated into an incandescent ball." "This little fireball, only a few millionths of a second old, contains the vaporized contents of the weapon, and a vast flux of energy created by the fission and fusion reactions of the nuclear explosion. So immense an amount of energy packed into a tiny space creates temperatures of 100 million degrees centigrade and pressures of millions of pounds per square inch. A violent expansion begins." 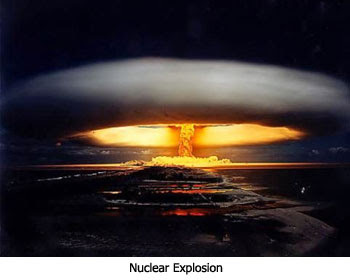 "In less than a thousandth of a second, the fireball of a one-megaton weapon has grown to 440 feet across. In ten seconds, the fireball is more than a mile in diameter." It should be evident that what we are talking about is a weapon unparalleled in human history; a weapon with the capacity to obliterate huge cities in seconds. This is a scenario that perfectly fits with the kind of swift, mass destruction spoken of in the book of Revelation. Indeed, considering the widespread death predicted by the Apostle John, it would be hard for us to imagine anything other than a nuclear holocaust which could come close to producing such carnage. The poisoning of the waters (Revelation 8:11), the severe reduction in visibility (Revelation 8:12), the death of much of the earth's vegetation (Revelation 8:7), malignant sores (Revelation 16:2), the end of ocean life (Revelation 16:3), and the inability of the atmosphere to block out harmful ultraviolet rays, resulting in severe burns (Revelation 16:8) are all expected results of nuclear war. The implications of these prophecies are not pretty — this earth has an appointment with a devastation which shall be horrible beyond imagination. i have a question (the answer is implied) if man is evolving and getting better and better, how come everything especially our weapons, is getting worse and worse? 100 yrs ago before we were really "enlightened" we did not have the capability to destroy the earth. A better question for Amillennialists is: If things are going to get better and better for Christ to return, when exactly does that start? Because, to me anyway, it looks like the Tribulation "theory" is truckin' right along. And, I like the question about evolution, hart. And, from a certain standpoint, the weapons aren't getting worse; they're getting better. That is, better at doing what they are designed to do which is kill people and break things. Although I have a facination with weapons and weapons technology (I love the Military Channel), I find it facinating as well, that the less "Christian" we become the more deadly our weapon-systems' are. Ven, up until the end of the Cold War we had a thing called "Mutually Assured Destruction" or MAD, which pretty well assured than nobody would push "the Button" as we used to call it. We built a bomb and we built a bigger one and so on. The muslims hvae no such qualms about MAD. I know what you meant, hart, and in my own way I agreed. Nukes will definately play no role in the vial judgments; they're all supernatural. I just think it's funny how some Christians say the world is gonna get better and better and better until we enter this golden age and Christ will return to find earth all warm and fuzzy, and we have ZERO EVIDENCE of this happening or the process even starting. Thunder, how true! It blows my mind how people can think that way. I was on a blog the other day, and someone said that we are in the millinium!!! I've heard that one before, but I still can't wrap my head around how anyone could think that!! And, if the world IS supposed to get better and better, and better, before the Lord returns, so that he can find it all warm and fuzzy and everyone holding hands singing cumm-by-ahhhh, then honey, he aint comin' back! Period! i want you to go back on that blog and ask the person "if we`re in the millineum why does it say in 1peter satan walks around like a roaring lion seeking whom he may devour" annd ask then why does it say satan is the prince and power of the air or why does paul say in his epistles how satan hindered his ministry. You gotta know that I've mentioned all that, but it's like these people shut off their hearing or something when you present them with evidence contradicting what they believe. They just won't hear it! So, at some point you just have to leave it to the holy spirit to get through to them....if you want to have any hair left on your head that is. PEOPLE WHO SAY "ILL BELIEVE IT WHEN I SEE IT ARE LYING" THEY SEE IT BUT STILL REFUSE TO BELIEVE IT. And Buggg, I totally feel you're pain and frustration. You would think they would at least listen, but nope. If they don't like it, they don't want to hear it. Why do you not understand what I say? It is because you cannot bear to hear my word. You are of your father the devil and your will is to do your father's desires. He was a murderer from the beginning, and had nothing to do with the truth, because there is no truth in him. When he lies, he speaks out of his own character , for his a liar and the father of lies. But because I tell the truth, you do not believe me. It is sad, Veni. That we, this "enlightened" people, have used our God-given knowledge to create weapons that, in a suitcase-size, have the potential to destroy a large city. And, as hartdawg pointed out, this didn't happen until after we were becoming enlightened and kicking God out of our nation. Gotta agree wit'cha Thunder! Taking God out of our nation was our BIGGEST mistake EVER! You know what I'm talking about, right? Pardon me, but I'm saying Merry Christmas.